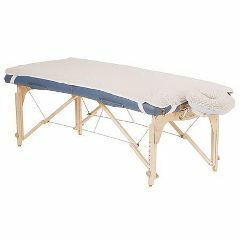 This is a Fleece Pad for your massage table that adds an extra half inch of luxurious comfort. It will keep your clients warm in the winter and cool in the summer. It also helps hold your sheets in place and protects the vinyl on your table. Finally a Fleece Pad that is machine washable and dryable. This is a great addition to your table as well as a great gift! 30" x 73". ½" thick. Available in Natural color only. Includes pad and crescent cover.